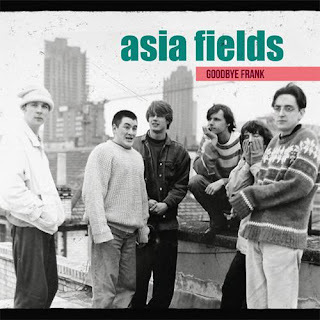 Goodbye Frank is a collection of recordings from Asia Fields, one of the long lost bands of the "Madchester" period as the Northern summer of love of 1989 went national over the following eighteen months. Whilst the band continued for many years this compilation is the first time most of their activity has been documented. In that period Asia Fields released one single - the Burst EP - on their own Frank Records label. The three tracks from it - Dazed, Save Me and Ain't That Just What Love Is - make up the first three songs on this compilation of otherwise unreleased tracks which mostly come from the 1987/8 period. Like many of their contemporaries around town, they remained persistently and stubbornly loyal to the idealistic independent spirit and watched the boat sail without them. Until now, their only recorded output was that 12" single and a further EP called Crazy Caroline that isn't included here. Like many of the bands that broke onto the scene in 1989/90, Asia Fields had been around for a few years already, starting in 1985 and slowly but surely building a following and a bank of songs whilst the London centric press searched everywhere for a successor to The Smiths oblivious to the fusion of indie and dance that was bubbling under the surface two hundred miles up the M1 and M6. In their early years they recorded at Clint Boon's rented space at The Mill in Guide Bridge in Oldham where many of the bands that were to break made their first recordings and rehearsed. The three songs from the EP are the most polished here in terms of production as you'd expect given they were released. For those looking for an easy comparison the songs possess that same effortless groove and sonic ambition that ran through most of the New Fast Automatic Daffodils' debut album Pigeonhole. Yet they predate that record by a couple of years. Save Me in particular wouldn't feel out of place alongside some of that period's big chart hitters on any compilation of that era, whilst Dazed sits comfortably on Cherry Red's recent excellent seven-disc Manchester North of England boxset and Ain't That Just What Love Is's underpinning rhythm was something that felt like a blueprint for many other bands to follow. The other twelve songs on Goodbye Frank do have a consistent sense of purpose running through them. They have grooves embedded in them of the sort that would make the loose-limbed youngsters of that acid generation fill the indie dancefloors of basement clubs like The Venue and Devilles in restless abandon. Whilst the band's recorded output might have been scarce, it's immediately evident here why they picked up a devoted live following. Know Who You Are is a delirious joyful track that screams breakthrough single as it captures photo perfect the carefree hedonistic spirit of the period replete with the simplest of singalong choruses and a breakdown that would have the remixers of the period falling over themselves to get to their hands on. The instrumental Bluke also feels like it's sat waiting to be introduced to a hot sweaty ecstatic nightclub. Asia Fields were never going to allow themselves to be pigeonholed though. Chances, There Is No One To Save You and This Feeling are different beasts altogether. Much warmer and affecting, lifted by multiple vocals, they and Waking Up stand much closer to the unashamed and underappreciated likes of James' Strip-mine, Inspiral Carpets' Dung 4 and those magnificent The Stone Roses b-sides that many think trump the album. Asia Fields' destiny should have been to have been talked in the same breath as the most revered icons of that time and place in Manchester. Most of Goodbye Frank stands the test of time today better than some of the lauded albums of that era that now feel carbon-dated and precisely located. Like The Man From Del Monte and The Bodines though, they disappeared from the public conscience as the backlash began although the band continued for several years and front man Graham Maley has kept his hand in with The Homelys and current project Aluna Pop Ups. Like them, they'll have to content themselves with revealing retrospectives like this and the love of those that could see past the music press' simplistic labelling of anything that came from within an hour's drive of the country's musical epicentre. Goodbye Frank, as a touch point for those made curious by their appearance on Manchester North Of England, should help cement their place in the hearts of those who delve past the Roses, Mondays and Inspirals into a golden period for the city and the surrounding regions. Asia Fields were for the most part of this record Graham Maley on vocals, guitar and percussion, David Jones on bass, backing vocals and percussion, Mark Finch on guitar and percussion, Eamonn Sheehy on drums and percussion, David Keane on congas, bongos and percussion and Paul Hewitt on congas, percussion and backing vocals. Goodbye Frank can be purchased via their Facebook page.